Kelley drawing a new piece with her youngest daughter in arm and two older daughters photos hung nearby on the wall. Kelley of Claw and Bone Art is not only a philanthropic Savannah artist, but she is a wife and mom of three; Fiona (10 weeks), Ava (6), Madilynn (8). Not to mention we've been fortunate enough to have her sweet family as neighbors for the last four years! 1. In one word how would you describe your mothering style? That is a hard one. Probably “improvisational” – things change so fast at any given moment. 2. What is your biggest struggle as a mom? The struggles seem to change as soon as you adjust to one. I think the struggle that stays constant through every phase is staying present; not worrying about your internal to-do list and staying off your phone. For example, I want to do another art show and I catch myself planning it in my head instead of watching the girls in those little moments. 3. What is the highlight of your day? Her husband, Kyle, and the girls. 4. What is your favorite thing about being a mom? Watching them learn. Seeing them experience things for the first time. It makes you realize the things you take for granted when they see something so simple and think “this is so wonderful” and I’m like “wow, you’re right!”. 5. As an artist, how has your work changed since becoming a mother? My art has always been about drawing from experience. So, inevitably it changed when I had kids because my experience changed so drastically. But having children has also opened me up and made me more emotionally vulnerable than ever before. My subject matter changed to focus not just on my children, but on children in general. I had to change my medium because I needed something more portable, I no longer had 8-10 hours to sit in a room and paint with oils. Now I use graphite because I can take it anywhere. 6. With two older children, is there anything that is different this time around with a newborn? Every one of them has been so different. When I was pregnant with Fiona I thought “this is going to be a breeze because I’ve done this twice”, but with everything that happened it was night and day. But now that she’s here it’s a lot easier. When we had madeline I was going from being a kid myself to well, the end of my childhood essentially. You would think a third kid would be overwhelming, but since we’ve been in parent mode already for so long, it has been easier. You’re already getting up early every morning and you know the feeling of devoting all your time to someone else. 7. What's your favorite rainy day activity? We are big tent builders. As soon as it even gets cloudy the kids are like “It’s tent time!” and we build forts in the living room. We actually used to have eyelets that were screwed into the walls where we would just tie ropes in so it was just automatic on rainy days. Get ready for the next rainy day with your kids and study up on 25 DIY Forts to Build! I probably have a lot over the course of three kids, but they’re so ingrained it’s hard to think of one. The only thing that I can think of is having the older girls read to Fiona. They have to read for homework anyway and the baby loves it so I can listen but do other things. It’s more of a time saving hack I guess. 9. Favorite lifesaving parenting product? Any sort of swaddle and a noise machine has been a necessity every go-round. Check out the 8 best baby sound machines of 2017! 10. What's your go-to weekday meal? I’m Italian so it’s going to be some sort of pasta product with some sort of sauce and cheese. It’s always ready in the pantry so I don’t have to think about it. Check out this article on "What to always keep in your pantry" - pasta is definitely on it along with other good ideas to be ready for the unplanned dinner! 11. Finally, what is the best tip or insight you would give a new mom? Oh, a first timer – that’s a hard one to think of because I always try to think back to when I was a new mom. I think I would tell them to ignore most advice you get because you get so wrapped up in trying to prepare yourself for things and you just can’t. When I had my first kid I remember thinking “this is not what you said it would be at all”. You can’t explain it and you feel worse if you listen to too many things. I think “mom advice” as a whole has gotten too invasive. Is your kid fed? Is your kid alive? Then you’re doing great. Fiona July sporting her Moss & Marsh Bandana Bib! Moss & Marsh Anniversary Party! Come celebrate Moss & Marsh's one year anniversary! *Free "Under the Sea" kids craft! *Block print your own T-shirt & onesie with Moss & Marsh characters! Shirts (2T, 3T, 4T) and onesies (NB, 6mo, 18mo) available for $10. Or bring your own shirt with a $5 suggested donation. Printing profits go to St. Jude Children's Hospital. *View our full product line up and meet the owner/designer of Moss & Marsh! 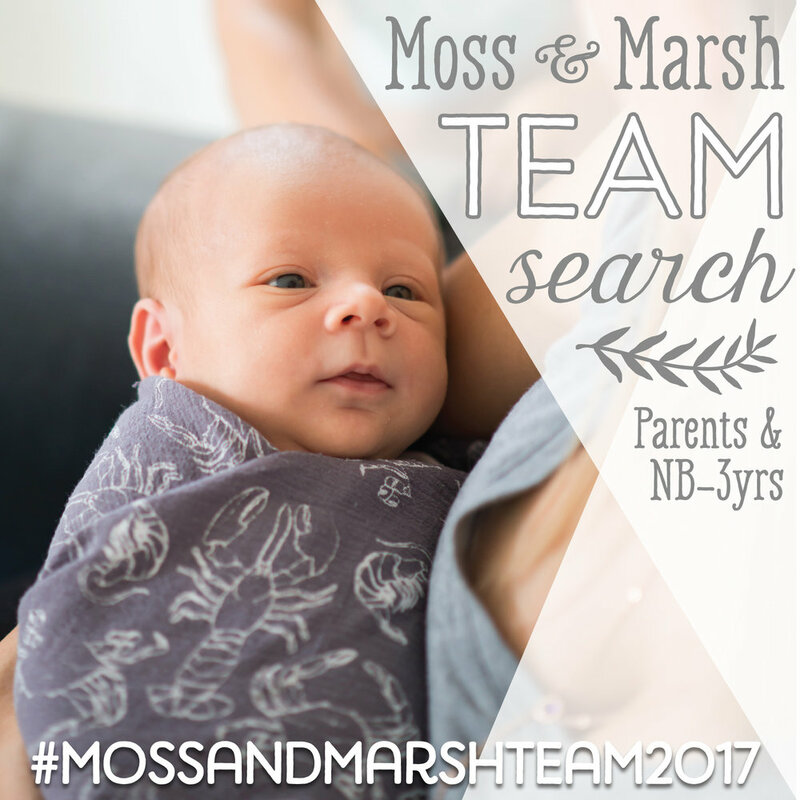 Moss & Marsh Team Search!! Do you love Moss & Marsh products? Want to be part of the Moss & Marsh team? And get free products?! Oh, and a 30% discount?! If you answered "YES! YES! YES! YES!" you're in luck...We're searching for a team of Moss & Marsh Brand Representatives. We need babies & toddlers, NB-3 years! And because we make parenting products, we need parents too!! This search is OPEN from now until 3/20! Our Team Members will get 3 free products and in return we ask that you post (and tag us!) 4 photos of each product over a 3 month period (roughly 1 photo a week). And help us by sharing and promoting any sales, giveaways, or promotions as well. Tag at least 2 friends below that you think would be great candidates! Comment below and tell us a little bit about your parenting style & child and why you'd be a great addition to our team. Tag at least one photo of your little one with our hashtag #mossandmarshteam2017 so we can check out your feed & kiddo! Instagram Accounts must be PUBLIC until reps are announced so that we can see your entries. If your account is private we will NOT be able to see your entries. *If you don't want to make your account public please ask us to follow you. • You MUST have over 500 Instagram followers to be considered for a Brand Rep position. I hereby authorize Moss & Marsh LLC to publish the photographs and videos taken of me, my family, and/or the aforementioned minor children, for use for promotional/advertising purposes in both print and electronic format when used lawfully for, but not limited to, promotional purposes, publicity, advertising, social media, and web content. I release Moss & Marsh LLC from any expectation of confidentiality for the aforementioned minor children and myself and/or my family and attest that I am the parent or legal guardian of the children listed above and that I have the authority to authorize Moss & Marsh to use their photographs, videos and names. I acknowledge that since participation in publications and websites produced by Moss & Marsh LLC is voluntary, neither the minor children nor I will receive financial compensation. I further agree that participation in any publication and website produced by Moss & Marsh LLC confers no rights of ownership whatsoever. I release Moss & Marsh LLC, its contractors and its employees from liability for any claims by me or any third party in connection with my participation or the participation of the aforementioned minor children, myself and/or my family.